Yes, I know it is rare that you hear a food writer recommending you go out of your way to dine at an airport, but Singapore’s Changi Airport is in a league of its own. First impressions can be indelible and international airports often reflect a countries mannerisms and a good indication of what to expect locally. 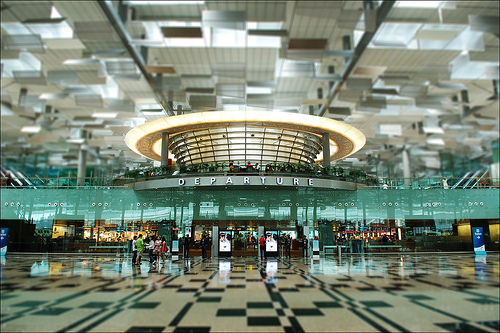 Of the 40 million passengers arriving at Changi airport annually, most first time visitors have that look of astonishment as they walk through what more represents a luxury shopping mall moreover, for those not in transit, there’s a palpable sense of wonderment as they clear immigration within minutes and ones bags are already circuiting on the baggage carousel. How can it be? Where is the usual torture of the excruciatingly slow immigration queues and ascetic customs officials? And the agonizing wait for luggage and tiresome taxi ranks. How can it be possible that I am checking into my hotel room only 30 minutes after disembarking from the plane! The super-efficiency and genuinely friendly service at Changi airport is certainly amazing although when you live here, after a while you tend to take it for granted. Indeed, many people only arrive an hour or so to catching a flight, with the certain knowledge check-in and immigration will be effortless. Putting this in perspective, when recently travelling back from Melbourne, Australia we allowed three hours for check-in and immigration and yet had to run to the departure gate, almost missing the flight. So when was the last time you heard someone say they were planning to have dinner at the airport? And actually knew which restaurant they had in mind, and we are not talking fast food here. I am more than happy to confess we eat at Changi airport all the time, mostly if we taking an overnight, long-haul flight, so when we get onboard we can actually just go straight to sleep. Ah, that is try to sleep, as we all know it depends if you have an Alcatraz easy chair or you are sitting/lying more towards the pointy end of the aircraft. Equally, if we are taking a short flight regionally, it’s far better to eat on the ground and not even bother with the in-flight food. Let’s be honest, unless it’s business or first class, and even then it would want to be one of the better carriers, there’s nothing redeeming about airline food. If you are going to Koh Samui, Thailand, Bangkok Airways departs from Changi Terminal 1, the oldest of the 3 main terminals, built in 1981, which you would think is tired and substandard by comparison to the brand new state-of-the-art T3. Saboten is located before going through immigration, upstairs in the collective restaurant area just to the left as you come off the escalator. If I am going to Koh Samui for work (8.10pm departure) my wife and 8 year-old daughter usually join me for dinner, sitting down at about 6.30pm, you have ample time to eat and go through immigration about 7.30pm to the departure gate. I have to declare, I am addicted to eating bread-crumbed, deep-fried pork Japanese style, so maybe this is a subjective recommendation. Still I find it hard to beat the excellent value and satisfaction of this simple dish, or more specifically the sets you can choose from. The pork used here comes from mature pigs which have a higher fat content and subsequently juicier, and also have barley added to their feed resulting in a sweeter, tenderer meat. 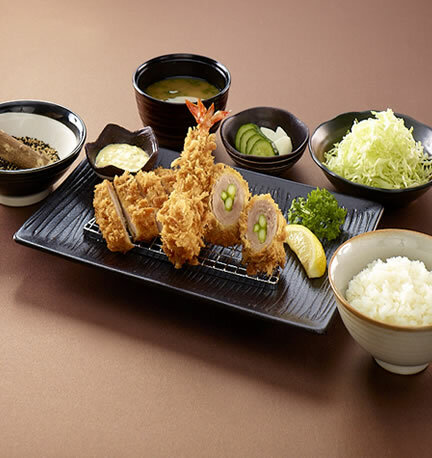 You can chose a cutlet from the tenderloin or loin, the tenderloin a little darker and has less fat, with the loin lighter in colour and firmer and considered the ideal cut for traditional Tonkatsu. With your set, a large bowl of shredded cabbage will arrive first and eaten as a salad to get the palate going. You can add ponzu sauce or Japanese mustard dressing, which is absolutely brilliant, a sort of Japanese take on Thousand Island Dressing only way better. Add a bowl of rice and some miso soup and you have a complete and very satisfying meal. There are also options of bread-crumbed prawns and Hiroshima oysters when in season – which are sublime, just cooked enough to crispy on the outside and lightly steamed in the middle. There are variations on theme including a sweet curry sauce and a steamed rice hot pot with pork cutlet, which is my daughter’s favourite. They say that the Portuguese introduced bread-crumbed pork (Tonkatsu) to the Japanese in the late 19th Century, which makes me curious if they also introduced to them to the Black Iberian Pig, known in Portugal as Alentejano. We also know English diplomats gifted the Berkshire Pigs to the Japanese at the same time, which they called Kurobuta, literally translating as ‘black pig’ in Japanese, which makes me wonder what the actual breed of pig the Japanese actually have. One thing’s for sure; the Japanese take their pork very seriously as they do at Saboten Tonkatsu, Changi airport. The service here is also very good, honest and efficient with the staff well aware everyone is under a time constraint and they do their level-best to get you feed as quickly as possible. I don’t think I need to convince those who live in Asia how good the food is at the Crystal Jade group of restaurants are. It’s extraordinary really, for a massive chain of restaurants, to have such authentic and genuinely wholesome, satisfying food and such great value too. There are no cutting corners or substandard produce either, just simply cooked no-fuss traditional dishes that are flavoursome and nutritious, from a basic bowl of soup noodles to the very best roast Chinese lacquered duck and superb crispy pork belly. For the initiated, and particularly those with the mindset that chain restaurants are substandard and to be avoided, you need to put aside your experiences in the USA of unhealthy iniquitous fast food or convenience diner establishments, as Crystal Jade is in a completely different league. And I believe largely due to the very fact this is Chinese cuisine, with many elements of it thoroughly nutritious and based on good, local produce. Also, the Chinese are hyper-critical, both on quality and price, and you can be assured if the food was no good or not good value, they would not be eating here. Being a Singapore Airlines devotee, we often depart from T3 and therefore dine at the Crystal Jade Shanghai restaurant which upstairs in the viewing hall (before immigration) and open 7am to 11pm. It serves up excellent Cantonese dishes and Hong Kong-style barbeque meats and poultry, along with dim sum, La Mian (hand-made hand-pulled noodles), Xiao Long Bao (steamed buns) and congee. As Cantonese restaurants invariably are in repertoire, there is something here for everybody. The restaurant is spotlessly clean and the service whilst no fuss and military like, it’s genuinely friendly and I take my hat off to the staff that have to endure a constant stream of demanding travellers. Over at T2, it’s Crystal Jade Restaurant, again in the viewing hall, level 3 and opens 8am to 10.30pm. It’s pretty much the same fair as over in T3, although they have been there for a long time now and one sense there is more of a restaurant environment here, even down to the super-friendly and skilful manager who directs traffic and looks after what appears to be VIP, return customers. Imagine that, regular clients in an airport eatery! Even though the menu and food is the same, I often hear comments, “Oh, the food is better at T2”, which is standard sparring in a nation where food is sport and there has to be a winner. Personally, I would go along to this to an extent, in that the service and atmosphere in the T2 restaurant does give it an edge and I sometimes take the train between terminals (5 minutes) to eat over there, just to do a little quality control myself, and that bit extra love from the well-seasoned team here. 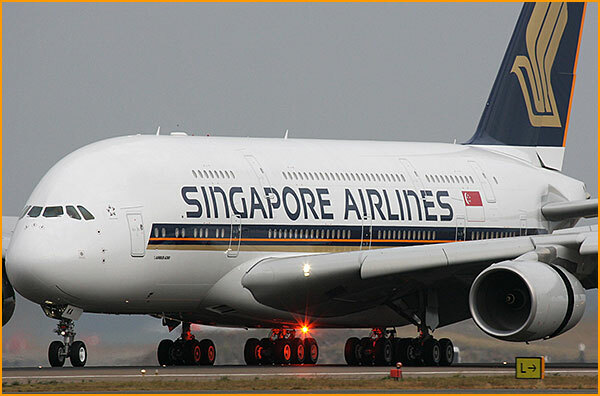 Singapore Airlines A380 - A Superior ride!